You are at:Home»Great Falls Montana»Around Town»Meet Bea! Meat Bea!, a photo by greaterfalls on Flickr. 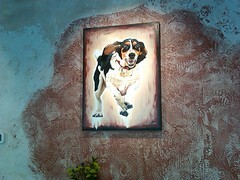 An amazing painting of Beatrice, the mascot and “owner” of the new Faster Basset eatery and coffee shop in Great Falls!